Israeli PM says he won't allow nation's soldiers to be "treated as war criminals"
(CNN) -- Israeli Prime Minister Benjamin Netanyahu, in a Monday speech at the opening session of the Knesset, slammed a United Nations report critical of Israel's tactics during its offensive into Gaza. In his speech Monday, Israeli Prime Minister Benjamin Netanyahu called the report an "absurd claim." The report, released last month, accused Israel of committing "actions amounting to war crimes, possibly crimes against humanity" during its military incursion into Gaza from December 27 to January 18. The report also accused Hamas of war crimes. Netanyahu told lawmakers, "We will not agree to a situation where the [Israel Defense Forces] commanders and soldiers will be treated as war criminals after valorously defending the citizens of Israel against a loathsome enemy." The prime minster's remarks followed a speech Sunday by Palestinian Authority leader Mahmoud Abbas, who defended a controversial decision to defer action on the United Nations report. Abbas has been the target of Palestinian anger following the decision to postpone a vote on a draft resolution endorsing the report, effectively halting any possible action against Israel -- or Hamas, a Palestinian Islamic fundamentalist organization -- for six months. Abbas said the additional time was needed to gather the necessary support for the resolution. Richard Goldstone, the South African judge who headed the U.N. investigation into the Israeli incursion, demanded that someone be held responsible for crimes committed during it. Netanyahu on Monday dismissed the report outright. 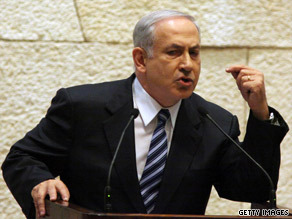 "The government and the people of Israel totally, utterly reject this absurd claim," he said. Israeli President Shimon Peres, also addressing lawmakers, called the Goldstone report "one-sided" and said it "will not determine our fate." "Out of the 26 suggestions that the [Goldstone] Commission made, none deal with how to fight terrorism," Peres said. "The Goldstone Commission Report says that the Palestinians have the right 'to forceful resistance based on the right of self-determination.' What is 'the right to forceful resistance?' To fire on civilians?" There is an ongoing dispute about the number of people killed in the three-week military offensive, which Israel called Operation Cast Lead. The Gaza-based Palestinian Center for Human Rights put the death toll at 1,419 and said that 1,167 of those were "noncombatants." The Israeli military released its own figures earlier this year, saying that 1,166 people were killed and that 60 percent of those were "terror operatives."